William Hewson (14 November 1739 – 1 May 1774) was a British surgeon, anatomist and physiologist who has sometimes been referred to as the "father of haematology". Born in Hexham, Northumberland, Hewson initially studied in 1753 at the Newcastle Infirmary, Newcastle upon Tyne (which later became the Royal Victoria Infirmary) under its founder Richard Lambert and much later in the winter of 1761/1762 in Edinburgh and was a student, and later an assistant, of William Hunter. He was awarded the Copley Medal in 1769 and elected to the Royal Society in 1770. His major contribution was in isolating fibrin, a key protein in the blood coagulation process. 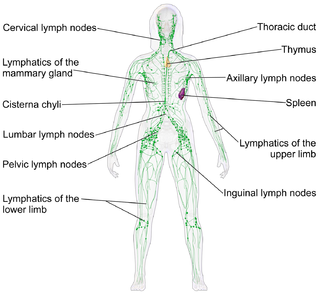 His Copley work came when he showed the existence of lymph vessels in animals and explained their function by hypothesizing the existence of a human lymphatic system. He also demonstrated that red blood cells were discoid, rather than spherical as had been previously supposed by Anton van Leeuwenhoek, but incorrectly identified the cells' dark centers as their nuclei. In 1773 he produced evidence for the concept of a cell membrane in red blood cells — however, this last work was largely ignored. On 10 July 1770 he married Mary Stevenson (better known as Polly), a London friend of Benjamin Franklin. From September 1772 he ran an anatomy school at 36 Craven Street, where Franklin lodged in London (which is now the Benjamin Franklin House museum). Initial estimates are that the bones are about 200 years old and were buried at the time Franklin was living in the house, which was his home from 1757 to 1762 and from 1764 to 1775. Most of the bones show signs of having been dissected, sawn or cut. One skull has been drilled with several holes. Paul Knapman, the Westminster Coroner, said yesterday: "I cannot totally discount the possibility of a crime. There is still a possibility that I may have to hold an inquest." The Friends of Benjamin Franklin House (the organization responsible for the restoration of Franklin's house at 36 Craven Street in London) note that the bones were likely placed there by Hewson, who lived in the house for two years. They note that Franklin likely knew what Hewson was doing. Proof was demonstrated by archaeological evidence which showed liquid mercury associated with turtle bones and vermilion colouring associated with dog bones found in the deposit. Hewson had documented experimentation on the lymphatic system using both substances and animals. He died on 1 May 1774 as a result of sepsis contracted whilst dissecting a cadaver. Hewson's work was continued after his death by Magnus Falconar, who had married Hewson's sister Dorothy in September 1774. Falconar repeated Hewson's experiments on the spleen and thymus and as a result re-published Hewson's work on red blood cells in 1777 together with his corroboration. ^ "Library and Archive Catalogue". Royal Society. Retrieved 18 November 2010. "William Hewson". Encyclopædia Britannica Online. Retrieved 2008-02-25. Kleinzeller, A. (July 1996). "William Hewson's studies of red blood corpuscles and the evolving concept of a cell membrane". The American Journal of Physiology. American Journal of Physiology. 271 (1 Pt 1): C1–8. PMID 8760026. Lee, Sidney, ed. (1891). "Hewson, William (1739-1774)" . Dictionary of National Biography. 26. London: Smith, Elder & Co. pp. 312–313. Red blood cells, also known as RBCs, red cells, red blood corpuscles, haematids, erythroid cells or erythrocytes (from Greek erythros for "red" and kytos for "hollow vessel", with -cyte translated as "cell" in modern usage), are the most common type of blood cell and the vertebrate's principal means of delivering oxygen (O2) to the body tissues—via blood flow through the circulatory system. RBCs take up oxygen in the lungs, or gills of fish, and release it into tissues while squeezing through the body's capillaries. John Singleton Copley was an Anglo-American painter, active in both colonial America and England. He was probably born in Boston, Massachusetts, to Richard and Mary Singleton Copley, both Anglo-Irish. He is famous for his portrait paintings of wealthy and influential figures in colonial New England, depicting in particular middle-class subjects. His portraits were innovative in their tendency to depict artifacts relating to these individuals' lives. Pia mater, often referred to as simply the pia, is the delicate innermost layer of the meninges, the membranes surrounding the brain and spinal cord. Pia mater is medieval Latin meaning "tender mother". The other two meningeal membranes are the dura mater and the arachnoid mater. Both the pia and arachnoid mater are derivatives of the neural crest while the dura is derived from embryonic mesoderm. The pia mater is a thin fibrous tissue that is permeable to water and small solutes. The pia mater allows blood vessels to pass through and nourish the brain. The perivascular space between blood vessels and pia mater is proposed to be part of a psuedolymphatic system for the brain. When the pia mater becomes irritated and inflamed the result is meningitis. Earl of Craven, in the County of York, is a title that has been created twice, once in the Peerage of England and once in the Peerage of the United Kingdom. Hereditary spherocytosis is an abnormality of red blood cells, or erythrocytes. The disorder is caused by mutations in genes relating to membrane proteins that allow for the erythrocytes to change shape. The abnormal erythrocytes are sphere-shaped (spherocytosis) rather than the normal biconcave disk shaped. Dysfunctional membrane proteins interfere with the cell's ability to be flexible to travel from the arteries to the smaller capillaries. This difference in shape also makes the red blood cells more prone to rupture. Cells with these dysfunctional proteins are degraded in the spleen. This shortage of erythrocytes results in hemolytic anemia. George Spencer, 4th Duke of Marlborough,, styled Marquess of Blandford until 1758, was a British courtier, nobleman, and politician from the Spencer family. He served as Lord Chamberlain between 1762 and 1763 and as Lord Privy Seal between 1763 and 1765. He is the great-great-great grandfather of Sir Winston Churchill. Benjamin Franklin House is a museum in a terraced Georgian house at 36 Craven Street, London, close to Trafalgar Square. It is the only surviving former residence of Benjamin Franklin, one of the Founding Fathers of the United States. The house dates from c. 1730, and Franklin lived and worked there for sixteen years. The museum opened to the public on 17 January 2006. The chairman is American-British investment banker and philanthropist John Studzinski. Sir Henry Strachey, 1st Baronet was a British civil servant and politician who sat in the House of Commons for 39 years from 1768 to 1807. George Gulliver, was an English anatomist and physiologist. Craven Street is a street in the City of Westminster, London, near Strand. A number of notable historical figures have lived in the street which was the home of Benjamin Franklin when he lived in London before the American Revolution.